Globalgig's Hotspot device is designed to work in the USA and the UK, for now. Australian company, Globalgig, has today announced a product that aims to take the confusion and hassle out of data roaming plans. The company's Wi-Fi Hotspot device is meant to be a simple-to-use product that can allow you to get data on your phone without having to search for and swap out a SIM card when you land at your destination. It's available for travellers to the US and UK for now, and Globalgig says it will add support for other destinations over the next 12 months, subject to deals that are struck with international carriers. The Globalgig Hotspot is a dual-band CDMA and GSM device that is pre-configured to work on the Sprint network in the United States, the 3 network in the United Kingdom and the Optus network here in Australia. When it's switched on, it will search for those networks and connect directly to those networks. Because it's a direct connection, the data rates you'll receive in those countries will be the native speeds that they support. Costs include $129 that you need to pay for the device itself, as well as a rate for a data pack. There are no lock-in plans and you can pay for data packs on a month-to-month basis. There are three simple plans to choose from: 1GB for $25 per month, 3GB for $39 per month and 5GB for $49 per month. If you go over those data limits, then you will be charged a fee of 5 cents per megabyte. All of these costs are laid out as per the company's "total transparency" philosophy and they aim to counter "bill shock". Voice calls and SMS will still work using your existing mobile number and global roaming charges. However, you could bypass those charges by using VoIP for your calls and sticking to email and online messaging instead of SMS. Globalgig says it is working on voice deals for potential future products. To ensure that the product works as intended, data roaming will need to be switched off in the phone. For travellers who want data when they travel to the UK or the USA, the Globalgig Hotspot seems like a smart choice, and any data that you don't use up while you travel and can be used when you get back to Australia, so you won't have to waste any of it. Globalgig is also targeting the business market with this hotspot, claiming it can be a very easy device to dole out to employees when they need to head off on international trips, or even interstate. The ease comes from the way the hotspot can be used and also from the basic plans and clear excess charges that are outlined in the plans. The hotspot supports up to five Wi-Fi devices and Globalgig says that it can run for about four hours on its battery, although this will depend on the usage scenario. There is a USB port on the device so that it can be easily charged through a laptop. Connecting to the Hotspot is simply a matter of finding it in the list of wireless networks on your phone and entering your password. 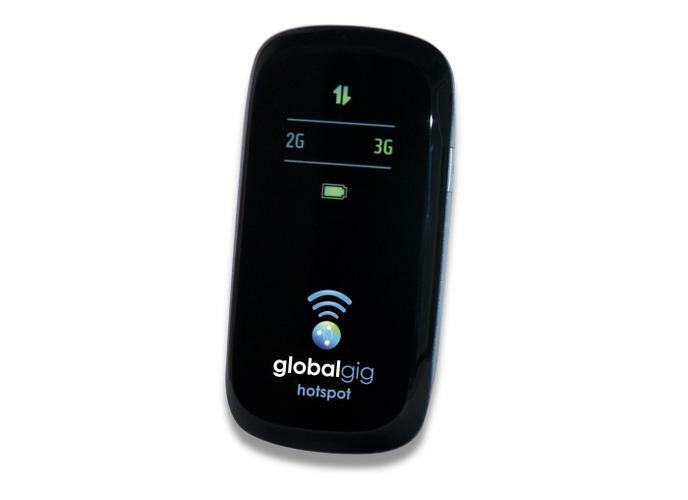 At the moment, the Globalgig Hotspot device is being sold directly through the company's Web site at: www.globalgig.com.au.